In October 2013 I attended my first action with the Coalition of Immokalee Workers. We marched outside a Wendy’s in Minneapolis, Minnesota. Chanting words like “Up up with the fair food nation, down-down with the exploitation.” I didn’t know that much about the Coalition of Immokalee Workers at that point, but I didn’t question what it meant to stand with them. Their work quickly became common conversation within the realm of the UMass Real Food Challenge (RFC). There’s a great deal of overlap between young people involved in RFC and the Student Farmworker Alliance who work directly with the CIW. A year and a half after that first march I found myself getting on a bus in New York City, destined for St. Petersburg, Florida. A mere 25 hours didn’t even seem daunting. I got on this packed bus with students from Boston, Providence, NYC, and five familiar faces from UMass. 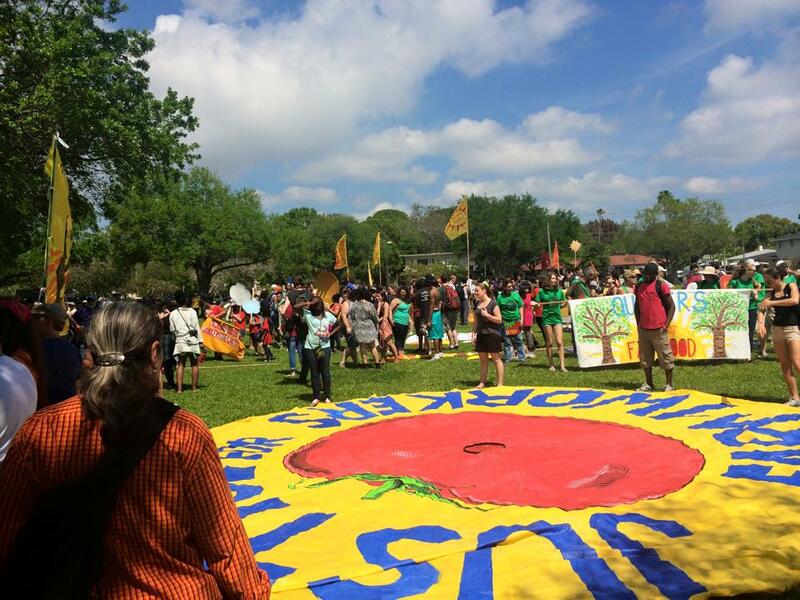 There were folks who are involved with the Student Farmworker Alliance, Real Food Challenge, the Audre Lorde Project, Make the Road New York, amongst others. We went around the whole bus introducing ourselves in English and Spanish as we began driving through the night. We arrived in Florida the next evening. It was already dark out when we got off the bus, but we did pull up to a circle of trees lit with white lights, a warm meal, new, and familiar faces. We were quickly welcomed in and spent the evening painting signs, making music, and sharing the warm air that many of us from the Northeast hadn’t felt in months. The next morning we were greeted by a breakfast cooked and donated by a local community group. Then we headed over to the park where the march would begin. When we arrived there were already floats being set up, flags being raised, puppets being set up, and signs being painted. There is almost no way to describe it. For the next few hours’ people began arriving. There was a huge range of people gathering around this park, carrying their own signs, their own stories. About a hundred members of the Coalition of Immokalee Workers attended, along side many of their kids, family members, and friends. Faith based communities came in full force, as well as student constituencies from around the east coast and Midwest. We began our 3-mile march that afternoon. There were vans being driven to ensure accessibility of the parade. We yelled, sang, danced, cried (maybe that was just me). 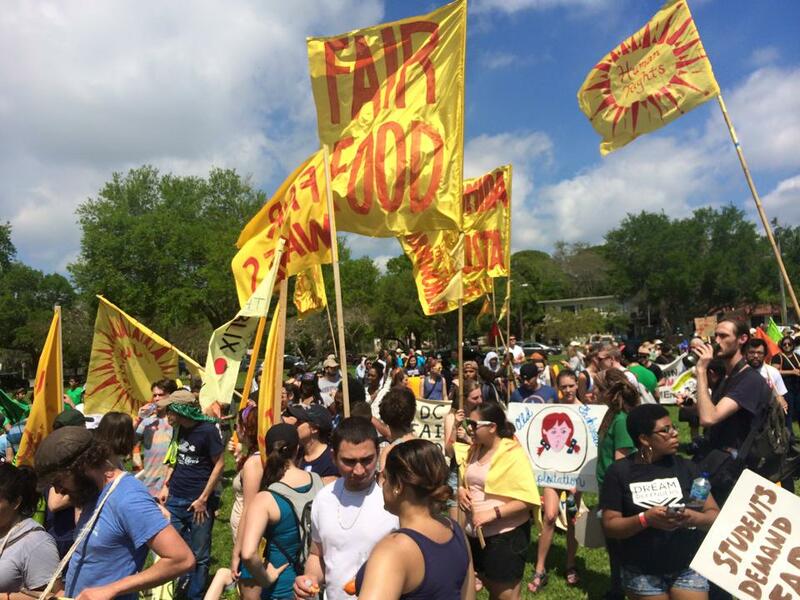 We went to Wendy’s and Publix, once again demanding that they sign onto the Fair Food Program. The workers led the march, followed by others who are on the front lines, and then allies followed behind. The CIW has a powerful model for solidarity and partnership. 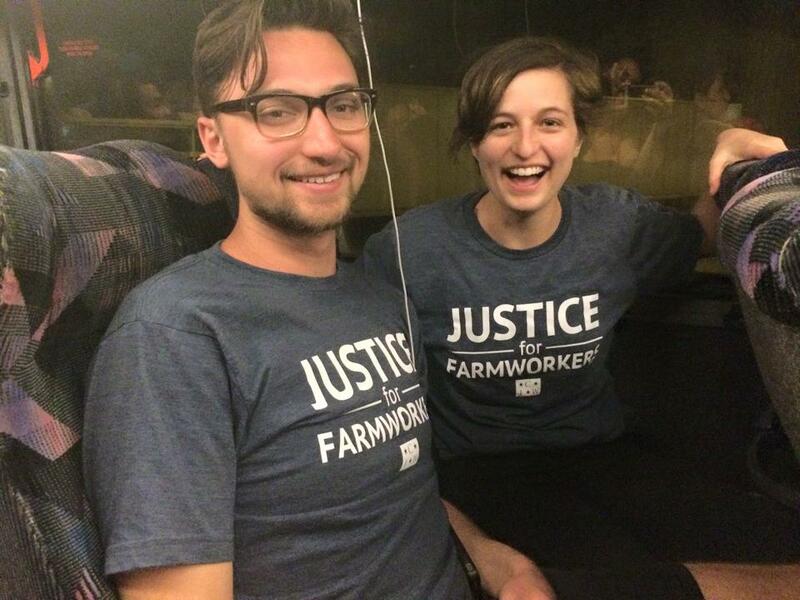 The Student Farmworkers Alliance works closely with the CIW in order to effectively organize campaigns that are based at colleges and universities. For example when the CIW was targeting Taco Bell to sign the Fair Food Agreement, students were able to target Taco Bell by pressuring their universities to cut their contracts. When we reached the end of the march, the celebration was just beginning. We struggled together that morning – we demanded that these corporations step up their practices. We acknowledged that there is still so much work to be done. But by that evening was about using art, music, and land to tell the story of the work the CIW has done and to celebrate the power they will continue to build. To start the evening, members of the coalition put on a theater piece that illustrated the story of their struggle. Then the Student Farmworker Alliance announced the national boycott of Wendy’s and the #bootthebraids campaign. I ended up sitting and talking with RFC folks and a farmworker for the Vermont dairy industry. These conversations are not only important, but they are absolutely essential. 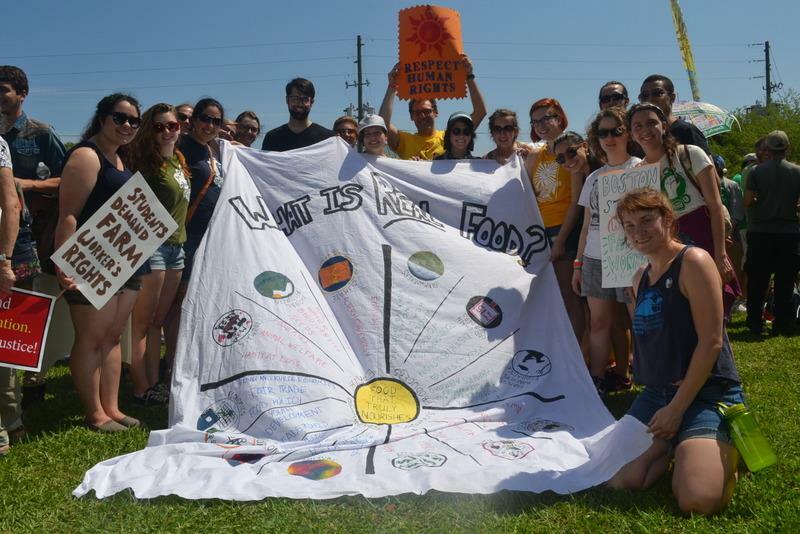 It is essential that we are centering the narratives of those at the front lines of our food system. It is essential that we are recognizing the intersection of immigration, race, labor and the ways in which our modern day food system is still deeply rooted in the logic of violent colonization and the plantation model. No matter how many classes I take at UMass, I will never understand what it means to pick 90% of the tomatoes that are produced in the U.S. But I am in a position to listen, to build connections, to march, and to follow the lead of those who do know. Perhaps the most important lesson I have learned from the Coalition of Immokalee Workers has been to show up.